The Manchester United manager is facing a stadium ban after he was sent off during the nil all draw between the Manchester United and Burnley. He was involved in a complaint with referee Mark Clattenburg at the Theatre of Dreams. The 53-year-old was sent off at half-time over the complaint, which involved the referee’s refusal to award a penalty during the first half of play. There was no immediate word on what part of the complaint caused the sendoff. made. Once again about a referee. Several of those incidents have also included fines and suspensions. He will face further charges once the referee submits his report into the game and details the exchange. Mourinho is expected to face either a touchline ban or stadium ban. The touchline ban will see him in the stands while the stadium ban will see him miss the game entirely. It is an unwanted distraction at a time when United need the points from upcoming games. They face Swansea City next and will need all the points from that game. 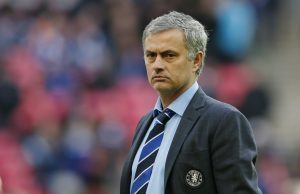 The bad news for Mourinho is that depending on the severity of the ban if he chooses to appeal and loses, he could face the prospect of missing the match against his old arch foe Arsene Wenger.